Lawn Mowing makes a yard feel good. 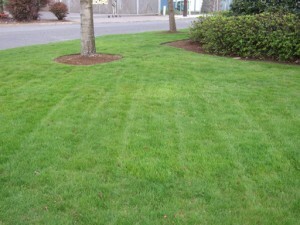 NE Portland lawn mowing is one of our specialties. Portland lawn Mowing. You may also want to talk to us about your NE Portland lawn plans. We love to help lawns and you of course! Plants need oxygen as much as they need carbon dioxide, but they need oxygen in their root areas. As people walk, play football or practice swinging the golf club on their lawn, they compact the soil, squeezing it together and removing spaces that oxygen normally fills. Plants use oxygen when they metabolize (break down) the sugar they store from photosynthesis. Without oxygen for this process, plants will literally starve. In addition to improving oxygen availability for plants, it also improves life for soil organisms. Lawn aeration allows water to filter more consistently through soil, and helps reduce problems with thatch.